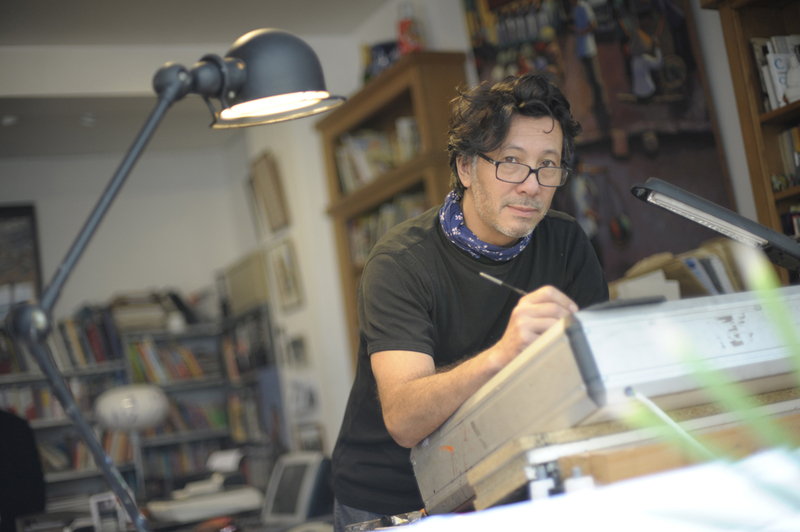 In this fifth article, Magali An has interviewed two notable Euro-Asian creative personalities: French-Vietnamese illustrator Marcelino Truong -who has just published his first autobiographic graphic novel about his childhood in Vietnam during the war; Paris-based Vietnamese actress and designer Yen Khê Tran Nhu- who has worked closely for the past twenty years with Tran Anh Hung, Vietnamese director of "The smell of green papaya” (Golden camera at Cannes Film Festival). These 2 interviews are part of a focus on creative industries and creative personalities from a Euro-Asian background. Actress, illustrator, craftsmen or fashion designer, they all have insightful personal stories. Whether they were born in Europe or Asia, whether they have chosen to live in their country of origin or decided to settle elsewhere, we discover in these interviews their artistic universe and find out how their double-culture impacted their creative lives. Marcelino Truong is a Paris-based illustrator, painter and author born from a Vietnamese father and a French mother. In his graphic novel, "Une si jolie petite guerre" (Such A Lovely Little War), published by Denoël Graphic, Paris, in 2012, Marcelino looks back in awe at the drowned world of his Saigon childhood at the outset of the Vietnam war. 1- Marcelino Truong, could you introduce our readers to your background? I was born in the Philippines in 1957 and take my first name from our street in Manilla, la calle San Marcelino. At that time, my father was a junior diplomat serving the Republic of Vietnam, or South-Vietnam in those days. We later moved to Washington DC, USA, until, in 1961, my father was called back to Saigon, as part of the J.F. Kennedy project to beef-up the American effort in South Vietnam. We spent roughly one thousand eventful days in Saigon at the beginning of what some foreign correspondents at first saw as a lovely debonair little war in an exotic country of elephants and tigers, but the conflict later morphed into the monstrous world-shaking Vietnam war. We left Vietnam for England in July 1963, a few months before both Presidents Diêm and Kennedy were assassinated. All this is, along with our day-to-day family life, I describe in much detail in my graphic novel, Une si jolie petite guerre, which will appear in Germany in April 2015, released by Egmont Graphic Novel, under the title Ein schöner kleiner Krieg. I grew up in London. We lived in the suburb of Wimbledon. My sisters, brother and I would hop on the District Line to go to the trendy French Lycée in South Kensington. At age 15, I was dispatched to a boarding school in Saint-Malo, Brittany. Having no idea of what I wanted to do in life, I decided to start by collecting degrees. I set off for Paris and its prestigious Institut d'études politiques (Sciences Po). I was 20 when I graduated and then moved down a step to the Sorbonne where I read English Literature, which to me seemed an almost Bohemian occupation after Law school. After accomplishing my military service in the Marine nationale, the French Navy, I went back to English Literature at the Sorbonne, ready to cram for the dreaded competitive exam called l'agrégation. I had however not completely given up doing something artistic, so I quit teaching English after a year and decided to plunge - kamikaze style - into the world of comics and illustration. This was back in 1983, for me, the year of living dangerously. I had to learn my trade on the job. One of my first breakthroughs was a commission for a four-page comics story in Metal Aventure, an avant-garde comic-strip magazine then run by Jean-Luc Fromental, who is now- thirty years later - my editor at Denoël Graphic in Paris. 2- Could you describe your artistic practice? My work runs in three main directions: illustration for adult and young readers in newspapers, magazines or books. I also produce paintings. The third direction was opened in 2012 with the publishing of my autobiographical graphic novel Une si jolie petite guerre- Saigon 1961-75 (Denoël Graphic), which I mentioned earlier on. The graphic novel is a genre for teenagers and adults which I find very fitting for my purpose. It's a crossbreed between a novel and a comic-strip album. I am currently busying myself with the making of the sequel (1963-75) under the title Give Peace A Chance. The animated film also beckons me, now and then. I designed the characters and sets of a 26' film by Henri Heidsieck called Petit Wang - Little Wang (La Fabrique, France, 2005), which was awarded a prize at the Annecy Animated Film Festival in 2006. For a long time I worked hard to learn my craft as an illustrator, with neither leisure nor space to think about writing. I do now. I feel that it is sometimes best when possible to write the story yourself. Otherwise illustrators are dependent on the texts which publishers hand over to them. Sometimes, you wait in vain for the story you are hoping for. In all my work, Asia and especially Vietnam, are quite often present. That's were being half French and half Vietnamese comes in. Asia and Vietnam are topics I have spent much of my life studying and well, I was, shall we say, "to the manner born". 3- Where does your love for art come from ? As a child, I enjoyed drawing. This is a gift which I inherited from my French mother Yvette who painted, drew, made ceramics, sowed, played the piano and was probably an artist at heart who ignored her real calling. My father was a very literary and erudite person - a great translator - very much the eternal scholar with a poet's sensibility, I think. He was good with a photo camera as well. My brother Dominique was really good at drawing too and I thought him more daring than I was. I think he could have become a very good artist had he not decided to head for the exit in his mid-twenties. Growing up in the sixties, I played endlessly with my Action Man toy-doll soldiers and designed sets for their battles. I pushed the realism quite far. Only a few of these photos have survived. I think that staging stories for my Action Men was somehow a clue as to a future path in art or written fiction. But at the time I didn't think that far, it was really out of my reach. I didn't come from an environment where such things were encouraged. At school, I was quite good at French, History, English and Art. But only the good marks in the "noble" subjects were appreciated at home. I've always thought highly of manual labour and skill and find it greatly underrated. 4- Is there any Asian artist who is a reference or an inspiration for your work? Of course, I'm very fond of the Japanese artists of the Tokugawa period. Who isn't ? : Hiroshige, Hokusai, Utamaro and so on…This liking shows in the three samurai picture-books for young readers I have produced, a series which starts with Le Samouraï errant - The Wandering Samurai (Editions Gautier-Languereau, Paris, 2006). Here's a senior Chinese comic-strip artist from Shanghai, whom I greatly admire. His name is He Youzhi. God knows how you pronounce it ! Born in 1922 ! Google his name ! I'm fascinated by his depictions of the daily life in China before and during the Maoist Revolution. 5- Do you think that your Asian background influences your work? I have always been interested in the history of Vietnam and in its way of life. These supply me with most of my ideas and subjects. I suppose this comes from my Asian background, of course. Maybe living away from Vietnam for most of my life has strengthened this obsession ? Perhaps if I had lived most of my life in Vietnam I would be attracted to and obsessed by the West ? I practice Tai Chi nowadays after having dabbled with several martial arts and feel much at home with those oriental gestures, postures and contortions ! 6- Tell us about your first return to Vietnam? A long story which would keep us up all night ! I returned to Vietnam in 1991, eight years after my first steps as an artist. I was eager to go back. Until 1986, the country was shut off from the Western world. Thus, in 1991, under a layer of grime and mold, almost nothing had changed in the Saigon I had known. In spite of the poverty and lack of freedom which afflicted Vietnam, I loved its people. I was lucky enough to be welcomed and chaperoned by one of my father's cousins, Ly Chanh Trung, a former senior civil servant of the Republic of Vietnam (the South), who acted as an undercover informant for the National Liberation Front and in 1975 became a member of the National Assembly. Thanks to him, I met all of my Vietnamese extended family, who had taken part in the revolution : a French-speaking generation just like my father. It was interesting to hear their stories, as I had grown up mainly in the West, away from the war and on the anti-communist side of the fray. This was of great help later for the writing of my graphic novel Une si jolie petite guerre. It's always important to hear what the other side has to say. 7- What does "double culture" mean to you and does it have an impact on your work and how it is perceived? I see myself as a sort of go-between, a courier, a ferryman, drifting from one shore to the other, from West to East and East bank to West bank, telling one world about the other. When you're a métis, a "mixed-race" (sounds awful, doesn't it ? ), you carry both worlds within you. I try to decipher one world and to make it clear to the other. It's about learning or trying to learn a completely different language : Vietnamese. It's throwing aside jeans and shoes as often as possible and running around in baggy thai pants and flip-flops. It's about boring my friends into a deep coma when I start lecturing them on this or that topic of Vietnamese history. It's also enjoying two very different cuisines. I do a lot of cooking, French or Vietnamese. Yen Khê Tran Nu is a Vietnamese actress and designer based in Paris, best known for her roles in the Tran Anh Hung's trilogy: Cyclo (1995), The smell of green papaya (1993) and The vertical ray of sun (2000). As Tran Anh Hung's partner and closest collaborator, she is also in charge of costume and set designs of all his films. 1- Could you tell us a bit about yourself ? Yen Khê is my first name which my grandfather has imagined ​​for me. This means “Fog on the source”, opacity and clarity, and I find that this antagonism suits me. I left Vietnam in 1974 to follow my family in France. I was one year old. My mother, my sisters and I came back to Danang in 1980, to visit my grandparents. It was five years after the war ended and the country was in such a big misery. Since then I have never stopped going back to my grandparents', and later, for work. I grew up in Paris but Vietnam has always had a special place in my heart. After high school, I spent one year at the “Ecole du Louvre,” followed by a degree in design and interior architecture at the Camondo school in Paris. Meanwhile, I took dramatic art classes, on the recommandation of my piano teacher, to overcome my shyness. Filmmaker Tran Anh Hung - who was looking for an actress for his short film graduates- found me in this class. I agreed to appear in his first film and since we have been working together on every project. 2- Describe your artistic practice. I was very young when I acted in the short film ”A married woman of Nam Xuong” which allowed Hung to shoot his second short film and meet Christophe Rossignon, future producer of his three movies about Vietnam. "The Smell of Green Papaya," won numerous awards (Golden Camera in Cannes, César for Best Film, Oscar nomination for Best Foreign Film) which helped the filming of 'Cyclo', filmed in Ho Chi Minh City, awarded with Golden Lion at Venice. It was an unforgettable experience. Then I went back to Vietnam with '”The vertical ray of sun,” this time in Hanoi. I was very lucky to be able to embody these beautiful portraits of Vietnamese women, as I did not grow up in Vietnam but felt very influenced by this culture. My parents were more anxious to transmit to us the culture customs, starting with food. I learned to speak the language with the Northern accent, leaving the the central tone from my hometown, much to the discontent of my mother. For me it was a wonderful way to get back to my roots and try to give the viewers a different view of this country. Beyond my role as an actress, I have always advised Hung on the visual aspect of his films. It is likely that I will do the art direction for ”Eternity,” his next movie which should run in 2015. 3-Where does your love of art come from? In my family, literature, poetry, painting and music have always held a central place. My maternal grandfather was a great doctor: acupuncturist, calligrapher and martial arts master. My mother was a literature and ancient Chinese professor at the University of Hue. She also had a beautiful voice and could have become a singer. But as the only daughter of a large family, it was permitted for her. My father has worked for 30 years for France-Libertés, in charge of humanitarian aid programs in Asia. He is the author of five books, four about Vietnam. My paternal grandfather was an engineer and left us beautiful sea paintings. All of this is undoubtedly part of who I am. 4- Do you think your Asian background influence your work? Arrived as a child, I did all my studies in France, like any French child would. This is how my mind and my thoughts have been formed. However in regards to my heart and emotions, things are much more complex. It is about atavism. I was lucky to grow up in Paris, into a mixed culture family in a cosmopolitan city which has allowed me to see the the greatest artists to the most confidential exhibitions, listen to music and read international authors, taste all kinds of cuisines. This is why I find the term "double culture" somewhat restrictive. I would rather say that I was bathed in a "multicultural" environment which forced me to make specific choices which built my personality. 5- What are your artistic references and sources of inspiration for your work? feel the closest to the Japanese culture: literature, film, architecture, design, culinary arts, fashion... ! The Japanese way of life has managed to combine tradition and modernity with inventiveness and unparalleled precision. It was a great challenge for me to go to Japan for the first time to design the costumes and sets of the movie “Norwegian Wood.” I especially designed eight sets at the legendary studios TOHO. I stayed one year in Japan and this time has deeply influenced me. 6-You are one of the few actresses of Asian origin based in France. What do you think of the absence of Asian faces in French cinema and in the media? Of course I regret that there is not more ethnic diversity in films and the media in France. Many people think that I only accept to act in Tran Anh Hung's films. But it would be ridiculous if it were true. It's just that there are very few roles for Asian actors. The Asian community in France is probably too low-key and therefore it creates no desire of representation in the audience's mind. In other words, Asians are "uneventful" as one would say. 7 Do your current projects bring you back to Vietnam regularly? Usually I go to Vietnam once a year. Often in Hanoi, because spending eighteen months for '”The vertical ray of sun” has marked me and have created strong friendships there. However in the recent years I spend most of my time in Danang to be with my family. It is a quiet and relaxing seaside town, near Hoi An, a charming village. In the future, I would love to explore further Ho Chi Minh City. I have actually just spend there two months to develop a design project of high-end furniture. When the time comes to decide where to live in Vietnam, it won't be an easy choice !